As we usher in a new year, I realize I’ve become a California girl at least in one respect: after a couple of weeks of temperatures hivernales (50ºF), I’m now ready for warmth and blue skies. I’m a wimp. But I can’t spend all my time snuggling with Lily! This leads to my reminiscing about my week in Arles last October. I had only passed through the Antique city on a previous trip but my friend Raegan was renting a studio and provided me with the perfect opportunity to linger and explore. The studio was perfectly located in the old part of town, a stone throw from Les Arènes and the Rhône river. We found ourselves randomly walking the narrow streets of our neighborhood. 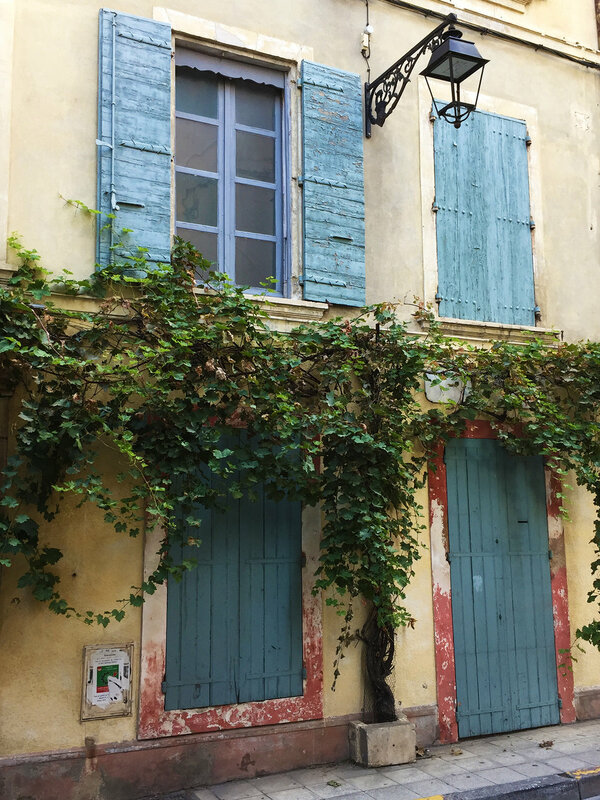 I fell in love with the three-story maisons de ville built of blocks of ochre stone and decorated with colorful wood shutters. Shutters, how do I (still) miss you! Even after some thirty-five years, that’s one thing a French girl living in California will never get used to. Shutters serve so many purposes: they shield you from the elements, heat and cold; they provide noise insulation and air circulation; they give you privacy. First and foremost, I love how they block sunlight in a bedroom and give me a fighting chance to sleep past sunrise. Rue Roulet. Check out the iron and glass marquise on the right side! The Greek already used marble shutters. The use of wood became prevalent in Europe during the Medieval Ages and the Renaissance but shutters were set on the inside for a simple reason: the fenêtre à croisée was not invented until the 15th century: if you can’t open the window, you can’t open (or close) outside shutters either. When you visit Renaissance castles, you’ll usually see evidence of hinges on the sides of the windows. The stone walls were so thick that wood shutters usually opened flat against the side walls, perpendicular to the window. Rue de la Liberté. Spooky in a beautiful way. As construction materials evolved, larger panels of glass could be manufactured and exterior walls became thinner; shutters were moved to the outside of the windows, circa 1750. At that point, the French started calling them contrevents although most people continue to use the more generic word volets. Rue Voltaire. An example of volets persiennés, shutters with louvers. Volets pleins are made from wood planks held together by a couple of horizontal boards or metal braces. 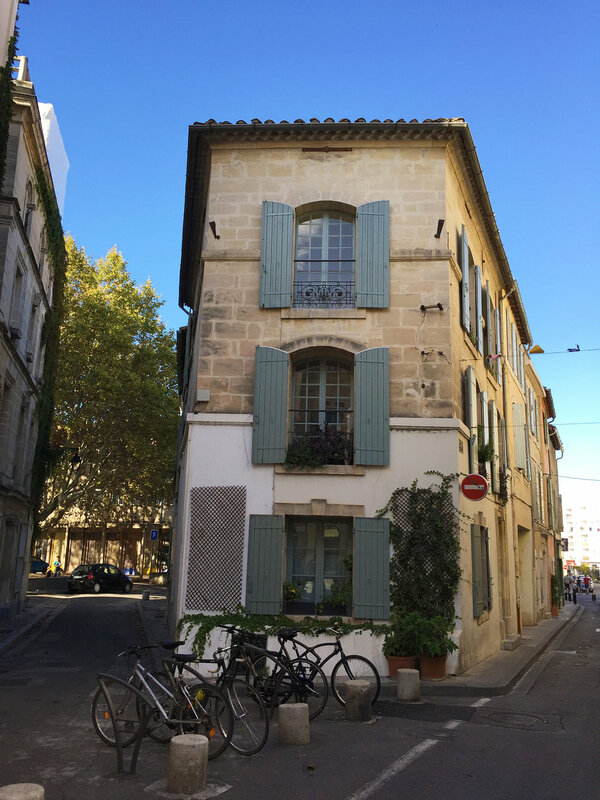 Often, but not so much in Arles, the boards will be shaped like a Z. Volets persiennés are made with angled wood slats that allow some air and light to filter in. Rue Molière. I loved the iron work on the shutters and the window! To hold open shutters flat against the wall when le mistral blows, arrêts de volets are screwed into the outside walls. The most prevalent design is called Marseillais and looks like a pivoting wing. My personal favorite is the tête de bergère, a bascule design that can be lifted up and pushed down to release the shutter. I always liked the face with the hat and used to call it petit bonhomme until I googled the term. Shutter stoppers: Marseillais (left) and Tête de Bergère (right).